In a previous article we have shown that the lack of clarity in the Council guidelines for planning (i.e. the Core Strategy) was seen by many developers as encouragement for tall buildings. However, recent campaigns (Putney towers, Clapham Junction Twin towers, CJ Hotel, Tileman House…) have shown that residents were definitely against those development and they have been asking with constance that their views be considered at the earliest stage of the application process… not only at the last minute in a gambling game of presentations and lobbying. English Heritage has recently published a statement listing 81 conservation areas in London, nearly one in five (1 in 7 in England) , threatened by “neglect, decay or damaging change” and at risk of losing their unique character. It includes Clapham Junction and East Putney in Wandsworth Borough, especially the two areas where apparently efforts are concentrating nowadays to build towers. ensuring that an adequate regime of planning control is in place to manage pressures for unsympathetic change through Article 4 directions reinforced by prompt action against unauthorised changes. Voices are raising from every direction against the current policy championed by the Council. There is no town centre plan and no specific guidance to suggest where tall buildings would be appropriate. The Unitary Development Plan is now elderly and of lessening relevance. The new Core Strategy for the Local Development Framework is useful but of limited value. There was modest public involvement in its production and it is doubtful whether it has wide public support. Its policies are strategic and of limited use in assessing the merits of individual proposals. No wonder that developers are concerned that they seem to be preparing redevelopment proposals in a policy vacuum and that, as has happened both at Tileman House and, earlier, at the East Putney, ‘Oracle’, Putney Place scheme, their proposals have caused dismay to local residents and also the council. Are the developers being misled by the council’s lack of specific planning policies? It appears so. It is for the council, as the local planning authority, to produce these background detailed policies: that is what a local planning authority is for. A Design Brief, included in the Supplementary Planning Documents should add details to policies laid out in development plan documents. The height of the building should fit comfortably with the adjoining buildings, which are not expected to be redeveloped for many decades, if at all. This would mean that each part of the scheme submitted in 2008 ought to be reduced in height: the western part of the frontage by 4 storeys, the central part by 5/6 storeys and the eastern part by 3 storeys; the rear block by some 4 storeys. The new building should compliment its neighbours, not ignore them. Nine Elms – final project? Real Estate Opportunities (REO) unveils another design (again!) at a public exhibition in June. It says this project is more financially viable than the last and includes a design that “respects” Sir Gilbert Scott’s Grade II* masterpiece. So out the eco-dome; out the curvy glass roof too. Despite nobody is highly questioning the opportunity to construct tall building in the area of Nine Elms (but not taller than the chimneys of the power station), critics claim the density and proximity of the terraces to the station is inappropriate. The Battersea Society said that the new housing must include a proper share of affordable housing and family accommodations. Furthermore it supports a boost for public transport (including the idea of a tram) and emphasises the importance of creating attractive surroundings at ground level, so that it will be a pleasure to walk and cycle through Nine Elms. It urges Wandsworth Council and the Mayor of London to rule out the area as a location for a major shopping centre as it might kill off other centres(you can think of Knightsbridge but also Clapham Junction or Brixton). We have reported in a separate article about the planning application submitted to the Council to redevelop the site of Tileman House. However, the application has generally created a massive opposition. There is already an animated debate with more than 90 messages (since mid-June, as of today) on the PutneySW15.com website. As written in the first post, most of the comments “fail to see how the minor alterations made to the plans address the concerns expressed in the hundreds of comments sent against the last application“. On the Council website, the latest count on the revised application is 179 objections and 3 in favour (as of 17/07). A lot of the objections are repeating the words “insulting our intelligence” and ” I do not want“. In addition, as confirmed by the Chairman of the Planning Committee, hundreds of comments on the previous application (ref 2008/5428) will be reported to the planning committee. “To the general public, given that their concern, when looking at this application, is what the proposed building would look like from the Upper Richmond Road, this new application is no different from last year’s application (No 2008/5428). In this context, the two applications are identical. “I am writing to object to the latest planning application for Tileman House. “The conduct of the developer in this case is deeply cynical. The tactics of withdrawal, inconsequential amendment and resubmission are nothing more than a war of attrition with local residents, who remain overwhelmingly against this overdevelopment. It is time-consuming for everyone concerned and deeply undemocratic. I pay tribute to the civic contribution those who feel so passionately against this overdevelopment continue to show. This application is likely to come before the Planning Applications Committee on 20th August. If you want to let the Council know your view, contacts details are available HERE with reference to Planning Application No 2009/1773. The Council has published the documents for the redevelopment of the site called Tileman House involving demolition of existing buildings on site and erection of building of between eight and fifteen storeys to provide 89 flats (22 affordable), roof terraces and balconies together with 807sq.m. ground floor commercial floorspace (flexible use for A1 (shops)/A2 (financial and professional services)/A3 (cafe/restaurant use)/A4 (drinking establishments) or D1 (non-residential institutions); 1600sq.m. office floorspace (Class B1); basement car park of 73 spaces (plus 2 at surface level for car club). This is an alterations to the previous application (ref: 2008/5428) to include; reduction in height of rear block by 2 storeys, loss of 10 residential units (including loss of 3 affordable units), reduction to the rear building line of the east block. More information (including comparison with the previous application) is provided by the developers in their documentation (download here) or directly on the Council’s website. The Core Strategy sets out the Council’s spatial vision, strategic objectives and spatial strategy on how the borough should develop over the next 15 years along with core policies and information on monitoring and implementation. This document is part of the Local Development Framework (LDF) and must be in general conformity with the London Plan. When adopted (after further consultation should take place in early 2010), these documents will, together with the London Plan, constitute the statutory development plan for the Borough. The Core Strategy 2009 document was submitted to the Secretary of State on 20 March 2009. The plan will now be examined by an independent Planning Inspector and exhibition at the Town Hall (Room 123) should be held from the 14 July 2009. The Core Strategy is therefore a document of the utmost importance. As shown in the previous campaigns against towers in the area of Clapham Junction Town Centre, the current document failed to give proper guidelines to the developers and was in total discrepancy with the views of local residents (more than 1000 protest against the Twin Towers’ proposal). “Taller buildings could not only help deliver significant regeneration projects but also give a visual focus to the Town Centre,” and further, “Taller buildings in this location could be justified due to the proximity of Clapham Junction Station and its accessibility to high frequency public transport”. In similar views, a meeting with the developer of the proposed 16 -storey tower block hotel at the bottom of Mossbury Road highlighted also that the decision to proceed with the hotel scheme was specifically driven by the Council’s recommendation in its Core Strategy document that Clapham Junction was a suitable location for regeneration through the construction of tall buildings. Two years had been spent developing the plans during which Redwood had met with the Council planners 3 or 4 times. 4.100 – The area may be suitable for taller buildings given the proximity to Clapham Junction Station. 4.101 – There are opportunities to provide high quality sustainable development with street frontages with taller buildings. It is clear that in case there is no drastic amendment to those guidelines, it will widely re-open all encouragements to developers to submit more pharaonic projects that the community will have to fight with the same energy they voiced their refusal of twin skyscrapers, but still without more support from the Council. Clapham Junction Town Centre is characterised by Edwardian and Victorian houses. Applications for constructions should respect the environment and not exceed the size of neighbouring (proportionate to neighbourhood, e.g. the rotunda of Harding and Hobbs should stay as the focus point in the area). The Council could easily amend the Core Strategy and also take advantage of the Supplementary Planning Documents (an optional document) to add details to policies laid out in development plan documents (these may take the form of design guides, area development briefs, a master plan or issue-based documents). You will find some additional information on the dates and linked documents on our Agenda page. Each day about 2,000 trains, most stopping, pass through the station, more than through any other station in Europe. At peak times 180 trains with about 135,000 passengers per hour pass through of which 65% stop. Interchanges make some 40% of the activity and by that count too it is the busiest station in the United Kingdom. Over the year, about 22 million passengers use Clapham Junction Station, i.e. 60,000 a day and TfL estimates to 10,000 users between 7am and 10 am only. The station has 17 platforms (platform 1 should welcome the tube by 2012) and is managed (franchise) by South West Trains on behalf of Network Rail. Clapham Junction station is often described as a utter disgrace, dangerous and users consider consider refurbishing the station as the most important priority. Birmingham New Street is a name of one of the busiest railway stations in the UK outside London with about 35 million passengers a year. The railway station is formed by 13 platforms and also The Pallasades Centre next to the station. The station is managed by Network Rail. New Street is frequently derided as one of the most run down and unwelcoming of all the major stations on the British railway network. But all similarities stop here: Clapham Junction Station has be left aside in the latest financing perspective for Network Rail to 2014, while Birmingham enjoys a £600 million project redevelopment, focused on the railway station. On 12 February 2009, the government announced that the Department for Transport will be providing £160 million on top of the £128 million that is to be provided through a government White Paper named Delivering a Sustainable Railway. A further £100 million will be provided by the Department for Business Enterprise and Regulatory Reform and will be channelled through the regional development agency (Advantage West Midlands). 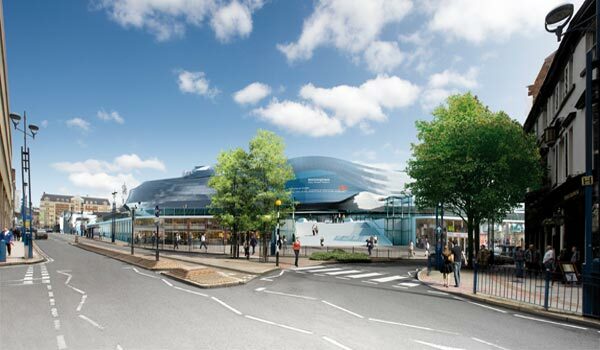 The announcement brought the total amount of Government spending on the project to £388 million as it agreed to meet all the funding grants sought by the different stakeholders, including Birmingham City Council and Network Rail. It is believed to approach £600 million with additional investment from private sector. The submitted projects were received by the end of January 2008 and a short list of 6 architects was announced in February 2008. It included Foreign Office Architects and Rafael Viñoly Architects along with CRAB Studio, IDOM UK, LAB architecture studio and UN Studio from 47 entries from the UK, Denmark, the Netherlands, Sweden and the US. 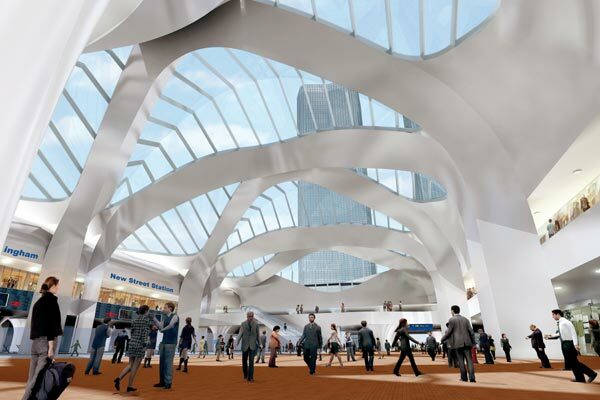 Expressions of Interest are invited for the appointment of a Concept Designer to develop the overarching vision for the building envelope and atrium roof that will define the external form to the £550m redevelopment of New Street Station, Birmingham. Its design will need to act as the catalyst for the transformation of the station, such that it is seen as more than just a functional entity, but becomes an integral part of the city and reflects the aspirations of modern day Birmingham. The Concept Designer will also be responsible for the building’s integration with the surrounding area, generating ideas for the station’s new central atrium roof, since it is likely to be surrounded by tall buildings, as well as informing the brief for new public spaces and possible art works associated with the redevelopment. 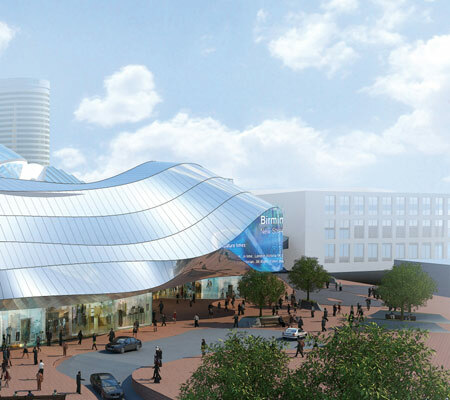 A provisional sum of £30m (Q2 2005 prices) has been allocated for the atrium space and external façade works. Although the external envelope may help to inform the interior, the detailed reconfiguration of the station, its organisational structure and operation has been the subject of a previous contract. The Concept Designer will be required to develop their vision in conjunction with an Integrated Project Team that will primarily comprise Network Rail, a Delivery Partner and a Lead Consultant. The Lead Consultant will be an engineering led company. The selection process is open to registered architects / designers. Candidates will need to demonstrate their ability to lead the design vision for the redevelopment of a major UK railway station. The successful candidate will need to be capable of producing (within the specified budget) an exceptional and functional design that will portray the dynamic, international character of modern day Birmingham. The Expressions of Interest will be assessed on the basis of the design / architectural practice. However, teams going through to the second stage may wish to include other appropriate professionals/consultants amongst their members, which might include a structural engineer, lighting engineer etc. The jury consisted of members from the participating organisations, Network Rail, Birmingham City Council, Advantage West Midlands and Centro, as well as Christophe Egret as RIBA architect adviser (the competition organiser). RIBA declared the name of the winner mid-2008: after over five years of preliminary planning, international design consultancy Atkins (hired to oversee the development) in collaboration with Foreign Office Architects (FOA, Alejandro Zaera-Polo winner of the competition for the design of the station) will be the joint designers of the New Street Station, to be known as the New Street Gateway. The project will be redeveloped in two phases enabling the station to continue to operate throughout construction. This will minimise disruption for passengers and make it possible for Gateway to deliver the first half of the project by early 2011. 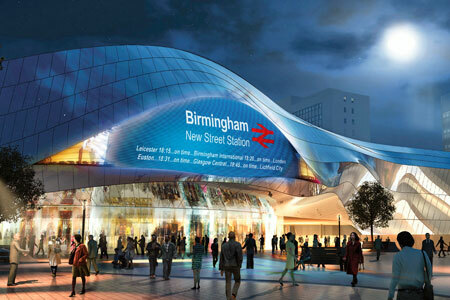 Birmingham council estimates the station will lead to £2bn of economic benefits. However they cautiously highlighted some concerns related to clarity of the diagram of the building, the impact of the south entrance, the shopping centre at the expense of the experience of taking a train. It is noticeable that the project will include also 2 towers of 30 stories, one residential and the other one for office space. However the project was mainly focused on the station redevelopment and the designer of the station was not associated with the towers. CABE is not supportive of the towers which they consider have indeterminate design but will have a huge impact on the city.